The US will likely persuade Russia to support harder international sanctions in the United Nations Security Council against the Assad regime, which may further pave the way for international invention. After assuming the post of US Secretary of State in February this year, the visit of John Kerry to Moscow is his first official visit though he met Russian foreign officials including Foreign Minister Sergei Lavrov on earlier occasions. The two-day visit starting today will mainly focus on the Syrian crisis, though bilateral and global issues may be discussed. Syria has no more been confined to a power tussle between the ruling establishment and the rebels, it has been entangled in the regional and international politics. After the air strike by Israel last week on the suburb Damascus, the regional tensions have been further heightened. Russia and China have criticized those air strikes, while the US has supported the Israeli strikes on the ground of Israel’s right to stop supply of arms to Hezbollah from Syria. The media reports of this week worldwide have been mixed in their interpretations of the visit and possible outcomes. China’s leading news daily Xinhua, quoting a Russian expert, observed that both the powers are “looking for a pretext to push forward bilateral relations.” The Moscow Times in its report adopted a cautious approach and observed, “Kerry is optimistic he can sway Putin; others are more skeptical.” The Telegraph of the UK quoted a US State Department official that “I don’t know if we will get an agreement or not, but we certainly think it is worth testing and trying to find some ways forward.” As per the schedule, Kerry besides meeting his Russian counterpart, Lavrov, will meet Russian President, Vladimir Putin. The visit will further contribute to bilateral relations and will prove crucial for the forthcoming meeting between Putin and his US counterpart, Barack Obama in the sidelines of G-8 meeting next month. 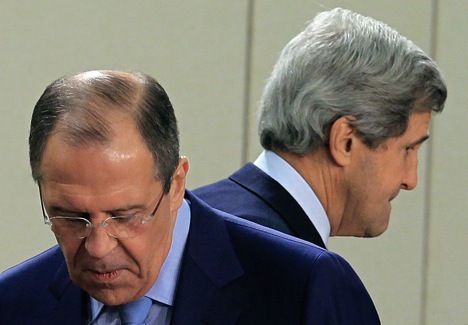 The major proposals from Kerry to Russian policy makers will likely be two-fold. The US will likely persuade Russia to support harder international sanctions in the United Nations Security Council against the Assad regime, which may further pave the way for international invention including military intervention in Syria. While the US along with allies UK and France is keen to have a larger UN mandate for the intervention, Russia along with China has vetoed any such proposals and rather harped on a political resolution of the conflict which has not been possible due to differences between these powers. There appears to be unanimity among both the powers that any violent regime change in Syria will buttress Islamic extremism with larger implications for the globe. Whether it is President Putin or President Obama – both have argued that the volatility in the Arab country may gradually turn it into an enclave of extremism. A recent paper titled ‘The true chaos will begin after the fall of the regime’ by Defense expert Jonathan Panikoff in US Department of Defense articulates that the real trouble will start after the departure of the Assad from power. Perhaps, the US would prefer a larger UN mandate, which will provide crippling sanctions on Assad regime and buttress the spirit of the rebels. The other likely demand will be that Russia renege from its arms commitments to Syria. Russia has naval presence in Syria, and both the countries have enjoyed friendly relations and trade including trade in arms. The US calculation has been that the Assad regime has used Russian weapons to fight the rebels. From a Syrian regime point of view it is protecting its country from the onslaught of the Islamic radicals supported by Al Qaeda. Though the movement in its beginning had indigenous elements, it was later seized by hard-line Islamic elements. The rebel group Jabhat al-Nusra has openly declared its allegiance to Al Qaeda, and they are supported with arms and finance by countries like Qatar and Saudi Arabia. The home grown resistance movement has turned into a sectarian conflict between Shias and Sunnis. As UN mediator Lakhdar Brahimi has pointed out on many occasions that the demand for ouster of Assad can be well articulated and executed through a peaceful and inclusive political process. The supplies of arms to Assad regime or to the rebels, hence, need to be seen in the wider context of peace and stability in the Middle East. It is difficult to say whether Kerry will break fresh grounds for dialogue and negotiation or the talks will end in a whimper. Kerry will use his diplomatic skills to strike a bargain with Russian leaders. If that happens, that will not only be a big achievement for Kerry, but also for Russia-US relations. But the question is: will it be possible? The recent months have not been propitious for bilateral relations. Issues like restrictions of citizens to visit each other’s country, differences over arms control, the US policies towards Russian opposition, and other issues like Iran have impacted the bilateral relations. In that sense, Kerry visit provides opportunity to clear some of the mist in bilateral relations towards creating a new ‘reset.’ Coming together of both powers will not only help craft a political transition in Syria and prevent a regional catastrophe, but will also help many other international issues like Korea, Iran and arms control. While the Obama administration at present weighing various options on Syria, some other political leaders particularly from the opposition Republican party have advocated for armed intervention even without the UN mandate. The issue of sarin gas has been used as a tool by some leaders, and there are fears that it may be used as a pretext for intervention. So far, Obama appears recalcitrant in using the option of intervention, and during his speech in Costa Rica last week he rejected prospects of armed intervention, and stated that there has not been any conclusive proof so far that the Assad regime has used sarin gas against the rebels. It may not be ruled out that the rebels may seize sarin gas and use it but blame it on Assad regime in order to entice the US and its allies for intervention. Russia has already expressed opposition any such policy of using the pretext of sarin for intervention. The results of Kerry visit will be decisive for Syrian crisis, and also for Russia-US relations with implications for the world. Outcome in terms of development of a joint-road map for Syrian transition will certainly be helpful in checkmating violence and radicalism in the region. Failure of talks will only add another layer of despair and dent prospects of peaceful resolution of the Syrian conflict.